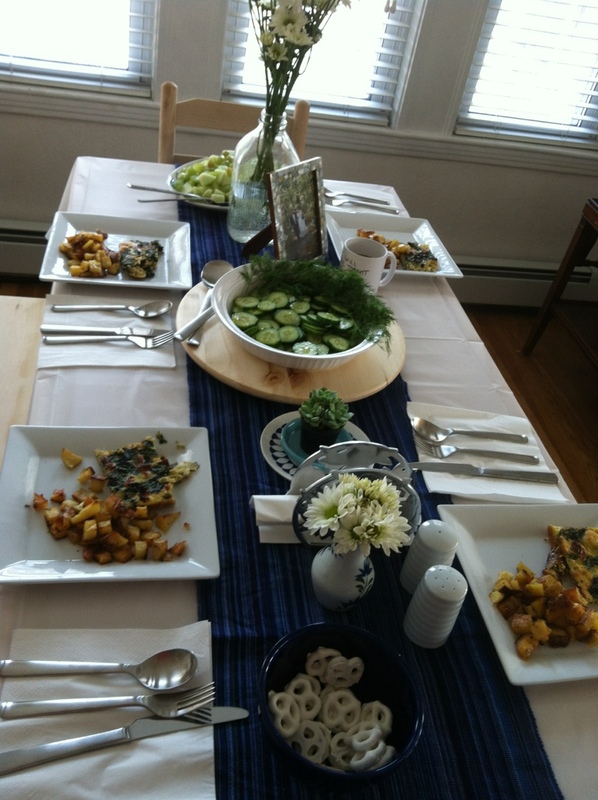 Last year, Mr. O and I made brunch for his parents on Mother’s Day weekend, and it turned out well enough that the menu’s worth sharing (even though I didn’t get around to posting it in time for Mother’s Day. Ah well). The short answer is: the hospital. For ten days. Yeah, you wouldn’t think the insurance companies would allow that, but, there I was, waiting for my diagnosis so I could get home. Turns out that I (Mrs. O here) have Crohn’s disease on top of ulcerative colitis, which means, for the short term, at least, a very restricted diet: no fresh fruits or vegetables (unless they’re cooked beyond recognition), no dairy, no whole grains, no caffeine, no alcohol. So we’re eating protein and potatoes over here, in a fashion that does not lend itself to food blogging. Once I start eating real food again, we’ll be back. 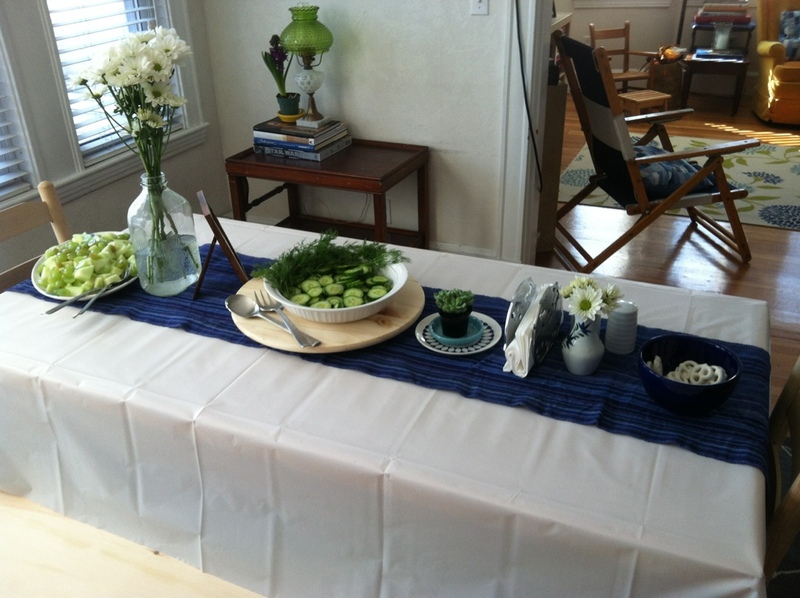 In the meantime, though, I welcome any and all suggestions for eating with IBD! 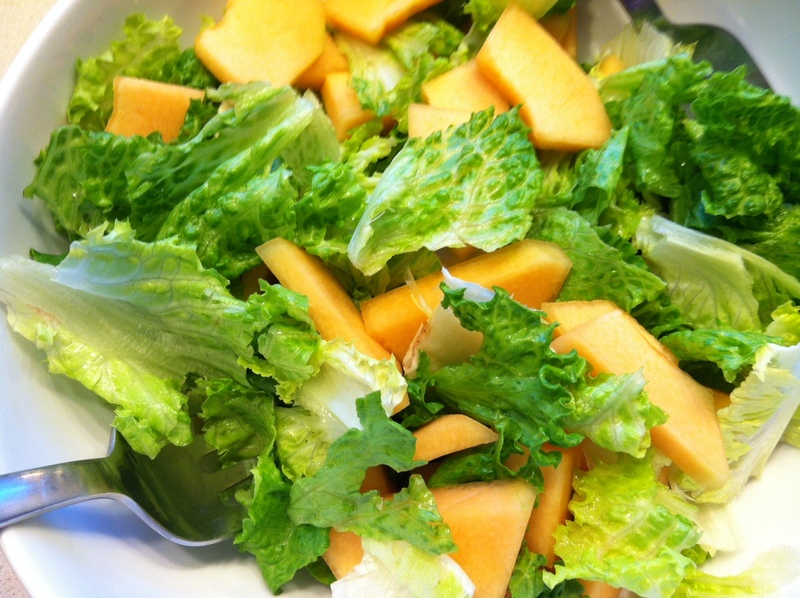 Largely self-explanatory, I think, but the combination of fresh, crisp green lettuce, sweet cantaloupe, and tangy, creamy dressing is a winner. water for thinning, as needed. 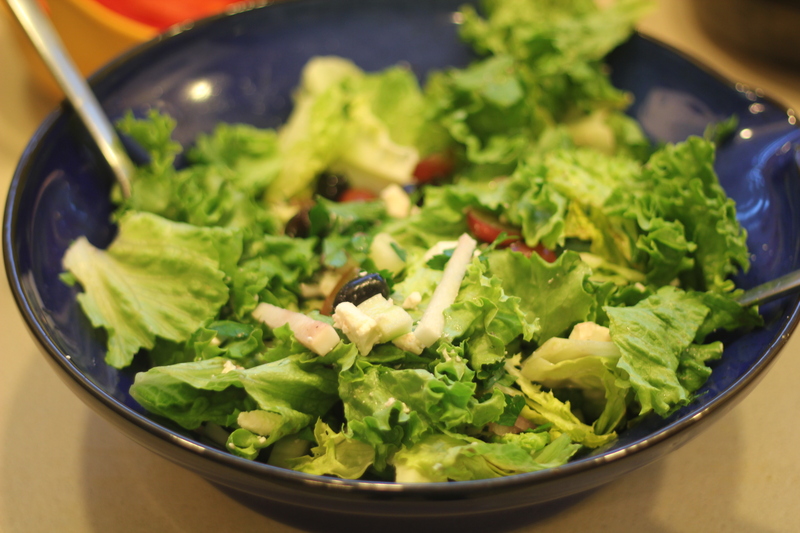 Toss with salad just before serving. Excellent as an accompaniment to spicy rice and beans. On Sunday, we had a delightful time hosting our friends MP and ER, newly engaged, for dinner (made even more delightful by E’s homemade chocolate-chip cookies). 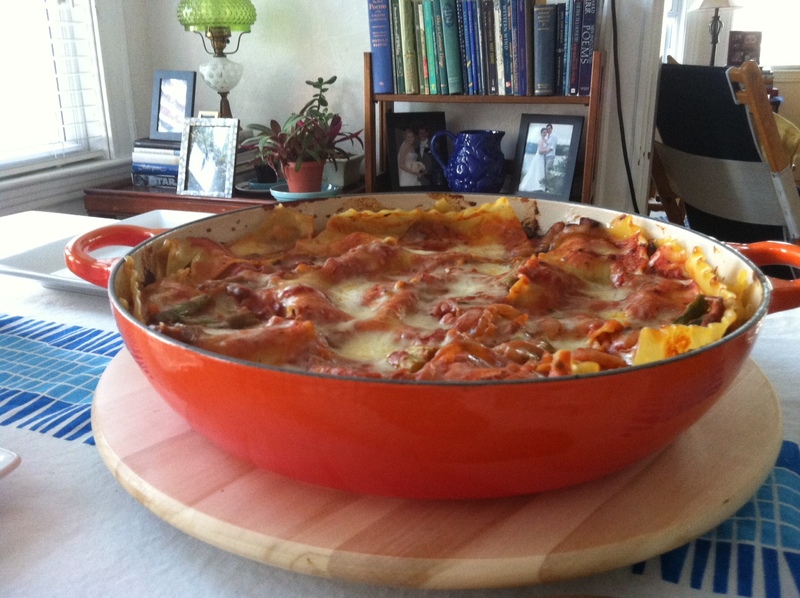 Mr. O had the brilliant idea to make our vegetarian lasagna (more on that in a sec) in our round brasier, because, well, why not? It fits perfectly on the table’s lazy susan and the color is so cheerful — perfect for a sunny evening dinner with friends. 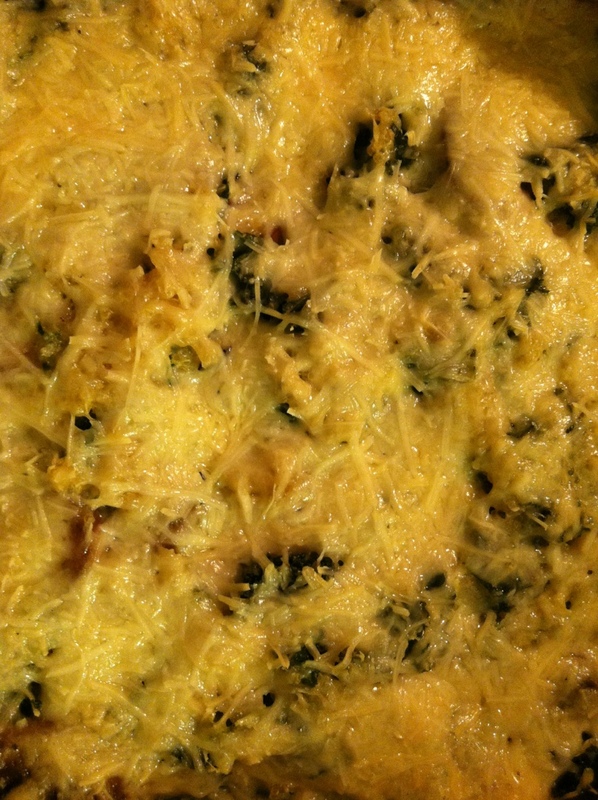 Now, we didn’t know that E is a vegetarian, so it was lucky indeed that we just happened to be making our tomato-based version of vegetable lasagna (we’ve written before about the bechamel-based lasagna, with squash and greens — a proven winner). I can’t say that I have a real recipe for this one — essentially, it’s an all-mozzarella lasagna with tomato sauce, layered with sauteed mushrooms, onions, and asparagus, with one tiny layer of fresh basil for flavor. 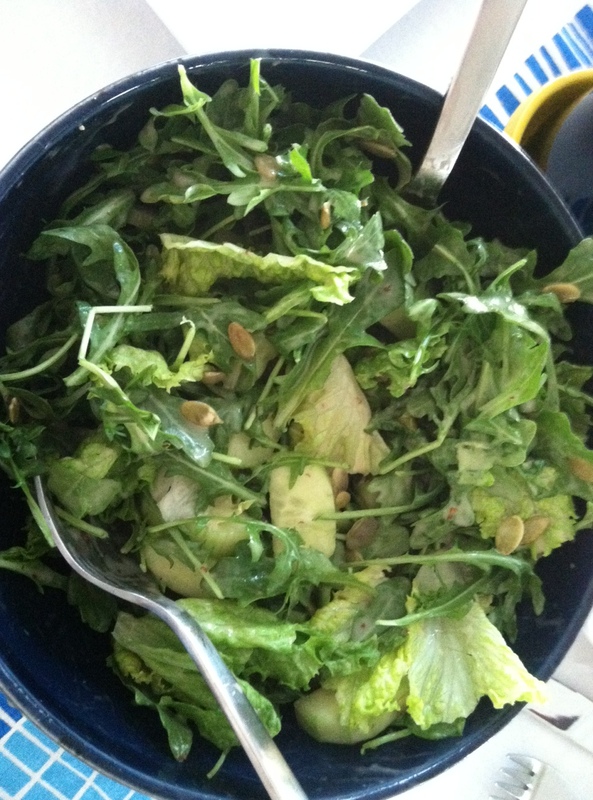 For the salad, we went with a mixture of arugula, green leaf lettuce, cucumbers, and pepitas, topped with Trader Joe’s champagne vinaigrette, since I ran out of time to make a dressing from scratch. 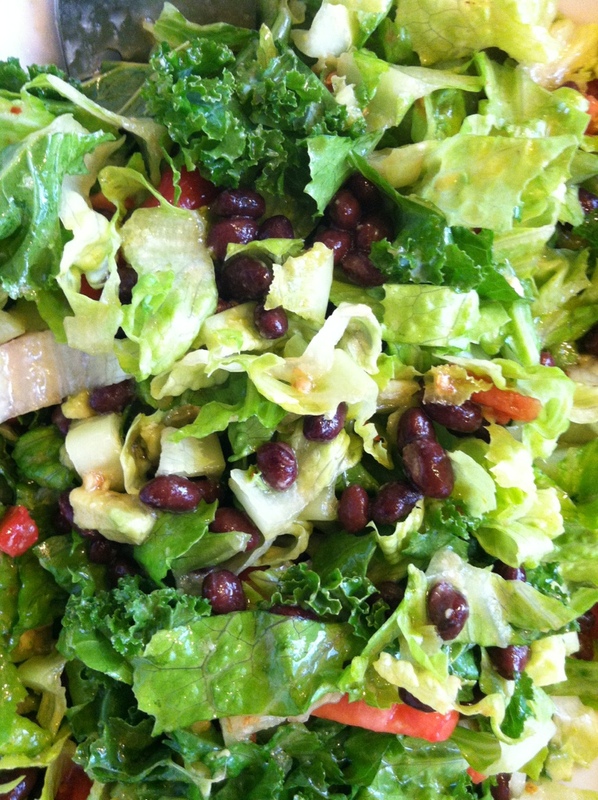 I think it’s a perfect match of salad to dressing, though, so I highly recommend it. This is the new house snack here at Chez O.
Upside: Delicious. Only 4 ingredients. And not peanuts, which I always feel are unsafe for about fifty percent of the people I know. Downside: long oven time. 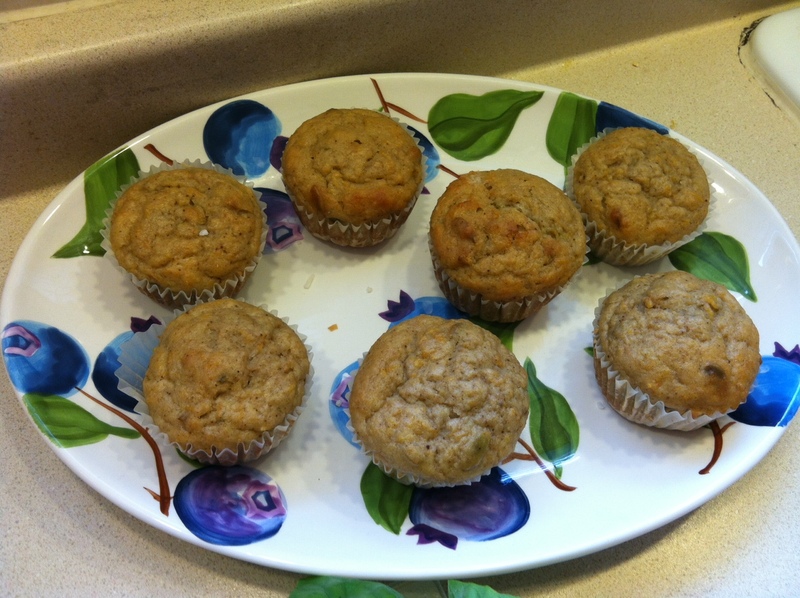 So delicious that a batch doesn’t last long. 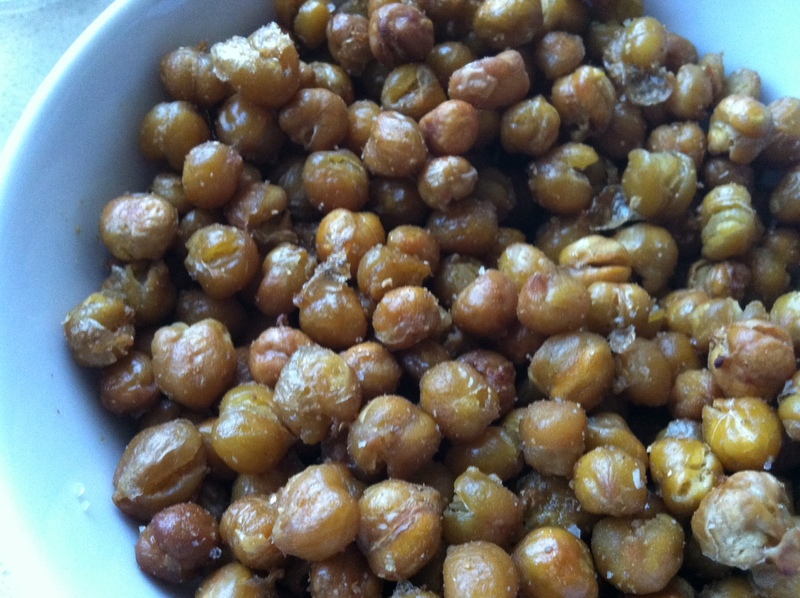 After draining the chickpeas, let them dry on paper towels for about fifteen minutes. 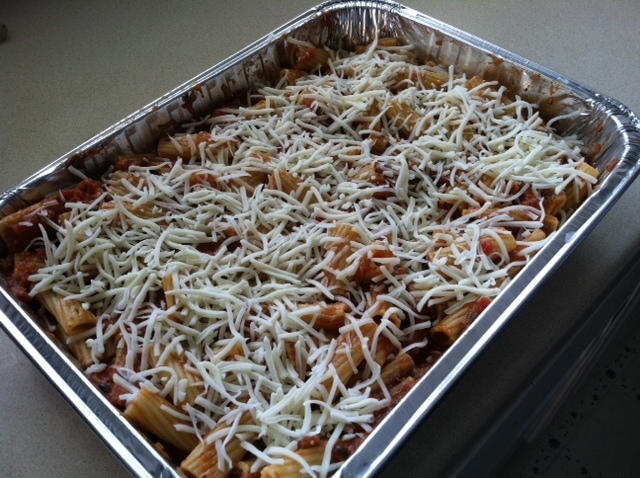 Toss with olive oil and pop into a preheated 400 degree oven for 45 minutes, give or take a few. 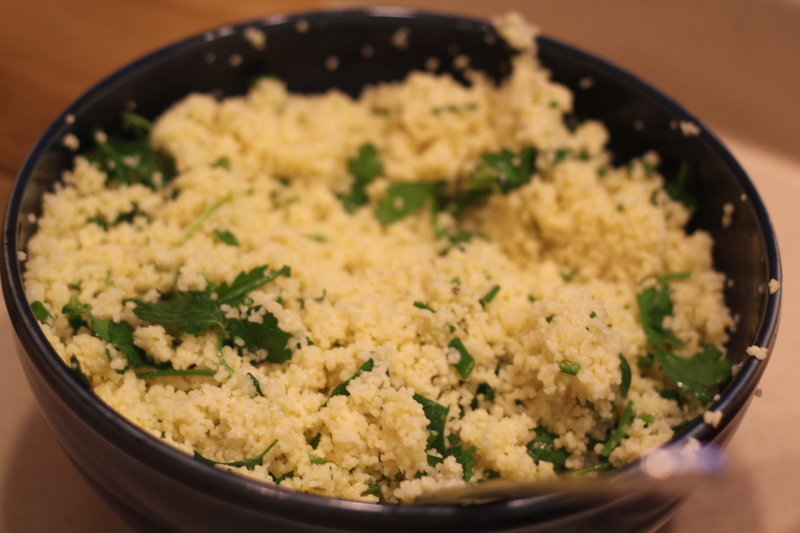 Let cool slightly, and toss with salt and coriander. Serve warm or at room temperature. A vegetarian dish that freezes well– perfect for dropping off with someone too busy or stressed to make dinner from scratch. 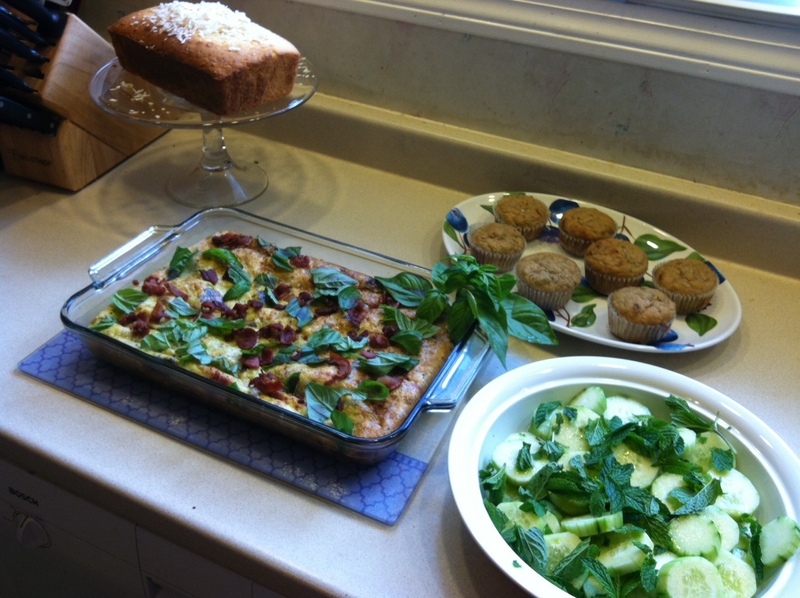 Dice all the ingredients, and even toddlers and Mrs. O will eat zucchini and mushrooms. Swiftly out of the sunshine, off the counter, and into my stomach. Taken on our porch, which we were very, very happy to get back to. Preheat the oven to 350. Cut each pita loaf into 8 wedges. 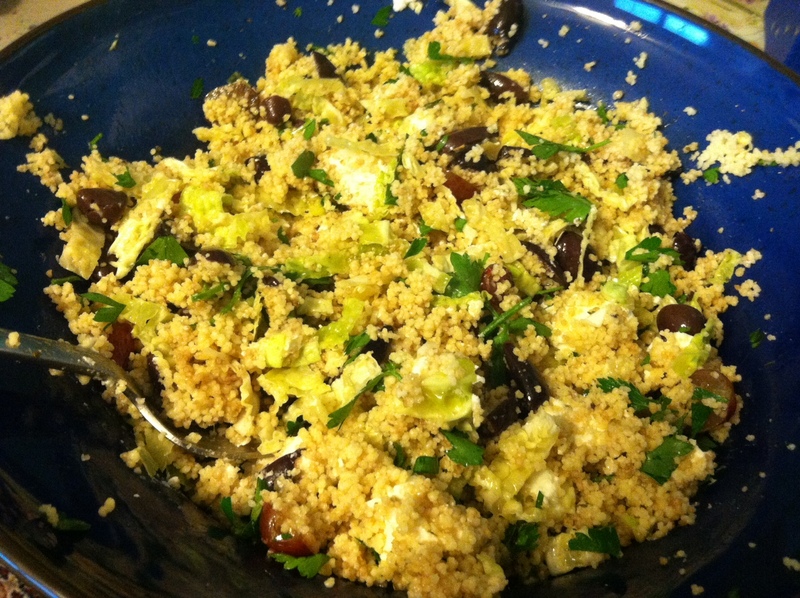 Toss with a little olive oil and sprinkle with zatar. Bake in a single layer (try a cookie sheet) for about ten minutes, until golden brown. 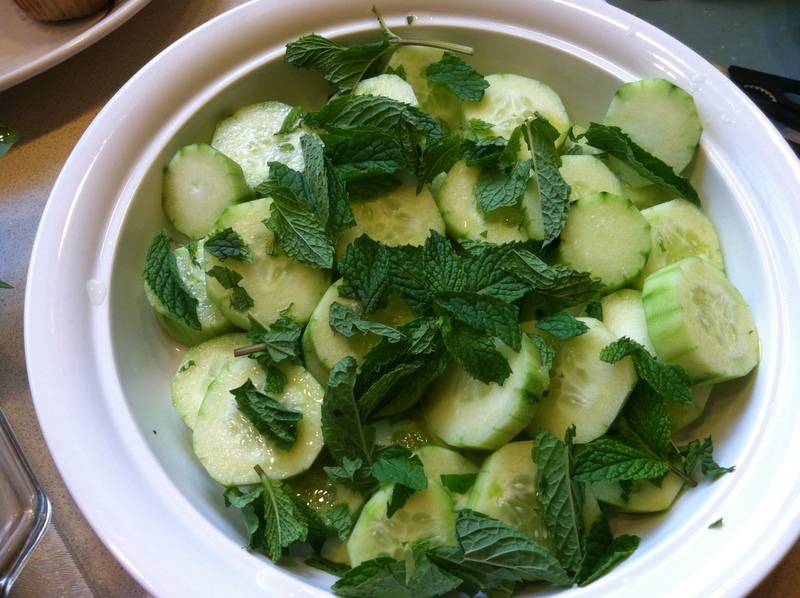 While the pita chips bake, grate the cucumber, and finely chop a handful each of mint and cilantro. 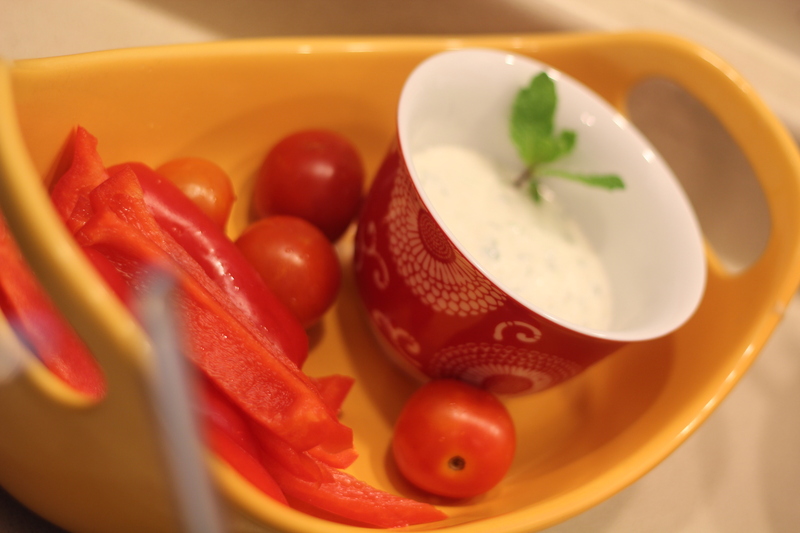 Combine cucumber, mint, and cilantro with yogurt in a small bowl. Season with cumin, salt, and pepper to taste (other traditional ingredients that you might consider tossing in: olive oil, garlic, lemon juice, parsley). 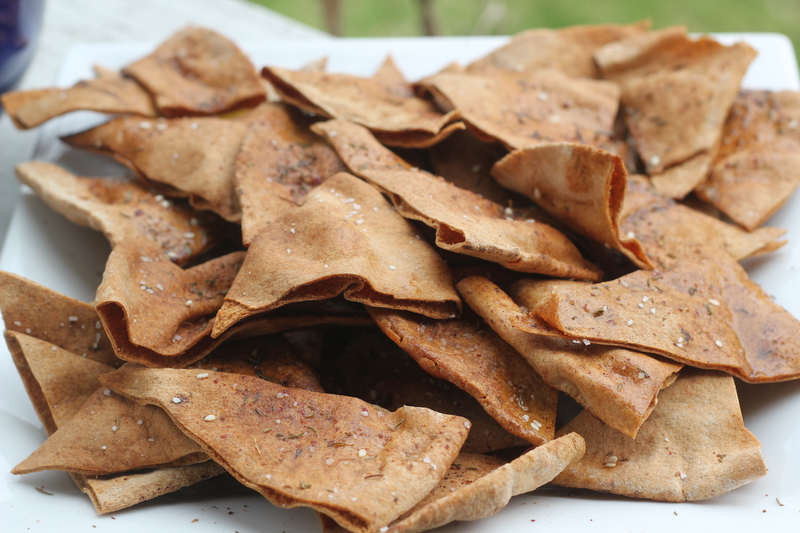 Sprinkle the pita chips with a bit more zatar when they come out of the oven. 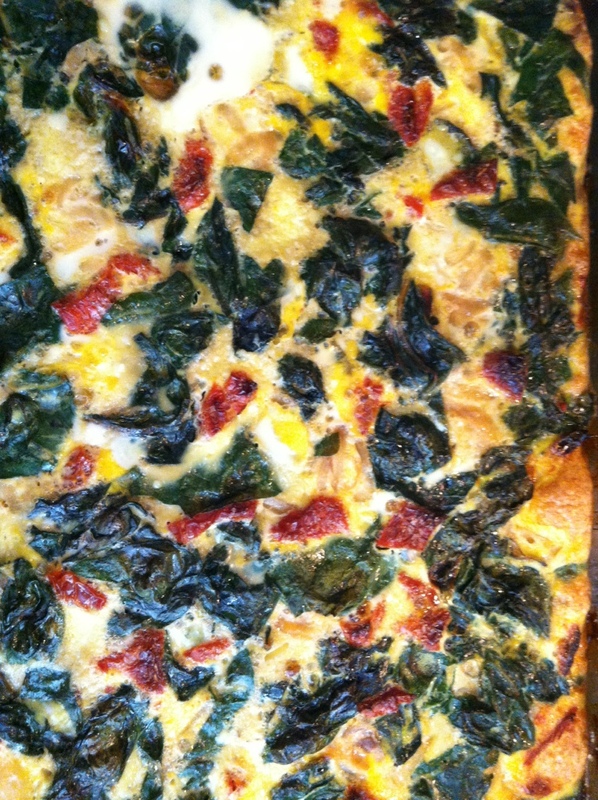 Drizzle with more olive oil if you like. 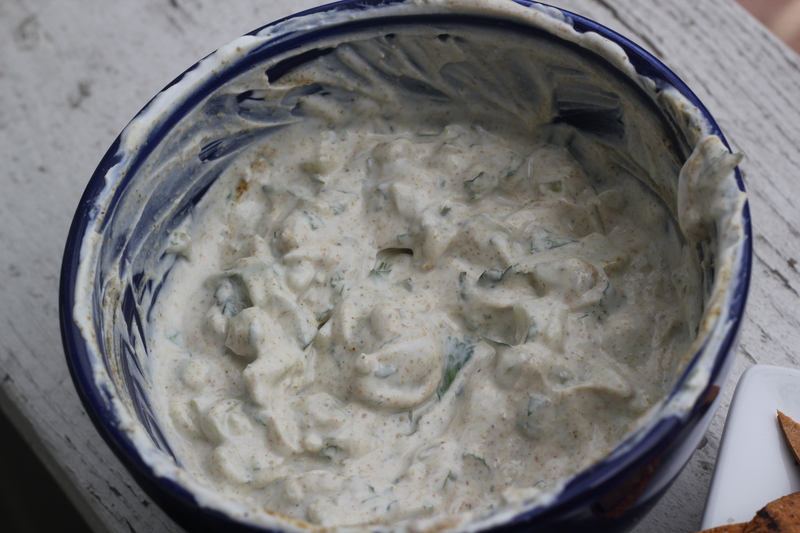 Serve with dip immediately. Almost immediately, we heard rapid gunfire. We raced to check that the doors and windows were locked, and my husband smelled something burning as he re-shut the front door. Over the next few hours, we took turns watching the side windows and comforting our son (not quite two) as the search helicopters flew low over our neighborhood. By 2:00am, state police had cruisers parked across the street, which was a great relief to us. Still, we knew that even with all the official resources directed at our town, the police couldn’t be on every side street, and so, in the dark hours, we kept an eye on our neighbors’ front doors, and they kept an eye on our garage and back door. Never, ever, have we wanted so badly for the sun to rise. A suspect with explosives at large in the darkness is far more terrifying than one at large in the light of day. We knew the sun would rise just before six. Friends kept us company online; our friend M, on facebook, encouraged us, reminding us that the sunrise was close, very close. We called our parents, texted with friends who were listening to the scanners for us, and eventually muted the news on TV, following just the headlines and updates on Twitter. We didn’t need to hear the descriptions of the scenes; Watertown is our town. My then-fiance found the listing for what would be our first home together on my mother’s birthday in 2010. Three months later, we moved into our first-floor rental on Mount Auburn street in Watertown, just two weeks before we were married. We were thrilled to bring our little son home to this bright, cheery space the next summer, happy to know he’d grow up close to Boston but far enough away from the concrete to see trees and flowers and little animals whenever we left the house. Even though we’re renters, we’ve come to love Watertown and the community here; it’s technically a city, but it feels like a small town. Police officers chat on their breaks from construction detail (one kind officer gave H a sticker and a chocolate last fall), and more than once the tricky door at the East Watertown Post Office has been held open for me (and H in the stroller) by Watertown firefighters. Our neighbors have become our friends, people with great advice and interesting stories; even in a crisis, they’re ready to laugh. Our kids play together. We shovel snow together. We talk about our favorite places to go in Watertown. And there are so may wonderful places here! We have favorite menu items at Red Lentil (Sesame Seitan Strips and the Omelet du Chevre) and the Deluxe Town Diner (the Best Calamari, Grilled Cheese with Tomato), you’ll find us at Russo’s every week (there’s always a new fruit or new vegetable to try — next time we’re thinking about tamarinds), and at Arax when we forget parsley or need a falafel fix. I read for my grad school oral exams at the Watertown Library, which has since loaned us life-saving Elmo DVDs for car trips with H. We walked down to the new frozen yogurt place on Wednesday (verdict: tasty), past the teams practicing on Hosmer field and our neighbors walking their dogs. And we love Watertown’s cemeteries, which might seem strange. But the Common Street Cemetery is a quiet place to walk and find unexpected historical markers and unusual names (Tryphosa is one of my favorites). In the opposite direction on Mt. Auburn Street, Mount Auburn Cemetery extends from Watertown into Cambridge. In every season it’s lovely, but in early spring it’s on the cusp of spectacular. The pale green buds dust the myriad trees chartreuse, and the magnolias and flowering cherries shock pink and white across the ponds; purple and blue flowers are carpets under trees, and stands of daffodils signal spring. It’s a garden, a reminder of life in the midst of death, a tribute to beauty and remembrance. I thought of Mt. Auburn Cemetery all day on Friday, as we waited, exhausted, for the search to end, fervently hoping that no-one else would be hurt. We imagined how lovely it would look on that day, in the warm sunshine. Watched the local police, state troopers, ATF and FBI vehicles and SWAT teams from all over (New Hampshire, Barnstable, Cape Cod) race down our street. Like everyone, we were shocked and horrified by the bombings at the Marathon on Monday, and were hoping that the suspects would be arrested swiftly and without further bloodshed, that the families of those killed and wounded would not need to endure a long pursuit of the suspects. We simply never imagined that their pursuit would happen in our town. All the cliches are true: it was surreal. It felt, at times, like a movie; we would see the emergency vehicles race past our house, only to see them reappear on tv thirty seconds later. It was frightening, but as the afternoon wore on, we felt lethargic after all the hours awake and on edge, and then we felt guilty for feeling that way when so many men and women were risking their lives to keep us safe. We prepared for possible evacuation, and realized just how little things, objects, mattered, in those moments. I put my engagement ring on (it was my great-grandmother’s), and that was it (we keep an archive of family photos on a hard drive outside the house, so that’s one thing we don’t worry about). Our son was sick, running a fever, which meant that he was more than usually willing to cuddle and watch the news (or Sesame Street, when the helicopters returned, louder than ever), but it also meant that we worried how we would get him to a doctor if his fever spiked. We watched and waited. 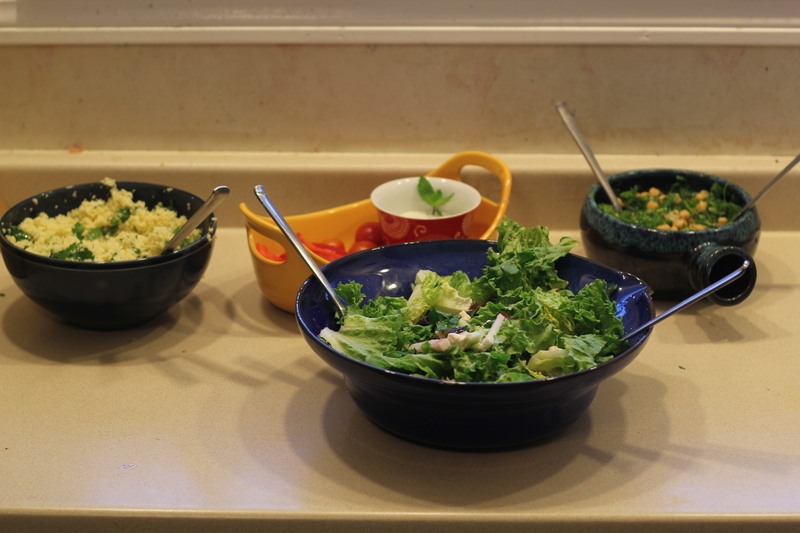 We did normal-seeming things to keep busy, to give our son a sense of routine: laundry, dishes, lunch. Made grocery lists, hoping we would be able to get out the next day. Read Goodnight Moon ten or twelve times. H arranged his matchbox cars in a single, upside-down layer on the coffee table. We weren’t alone, really, though we were all confined in our separate houses. We kept in touch with our lovely neighbors and friends, both in Boston and around the country, and felt reassured when we saw the cruisers across the street. Our landlady, who lives upstairs, spent the afternoon cooking and brought us a huge bowl of meatballs and marinara sauce for dinner, and a package of M&Ms, H’s favorite. It was such an act of kindness, and love. She was worried that he was frightened, and knew that he wasn’t well since she hadn’t heard the patter of his little feet during the day; H only ever runs from place to place. He perked up when he saw her (and the “M-Ms”), and from then on, he got better and better, waving to the troopers out front in their “ray-car” (the striped police cars look like his matchbox race cars to him). At the 6:00 news conference, we were relieved that we’d be able to step out into the fresh air, but worried about another dark night without knowing where the suspect had gone. We were just about to step outside when a neighbor texted, letting us know that she had called police after learning that her neighbors were out of town and had left their doors unlocked. Within minutes, ten officers with very large guns were taking up tactical positions between our house and theirs. The search was fast and efficient, and of course, came up empty. Drizzle surrounded us as we drank deep breaths of fresh air outside. Our neighborhood came alive as people went out to walk, to buy milk, to just breathe. H was thrilled to finally be able to see the helicopters he’d been so afraid of, following the Blackhawks with his finger pointed toward the sky. Then Ben and I saw a cruiser speed by doing at least seventy or eighty miles an hour, light flashing, no siren. We looked at each other — that wasn’t right. I checked Twitter and text messages; nothing. Minutes later, we heard the all-too familiar sound of gunfire. Closer, this time. The evening before the shots had been five or six tenths of a mile away; now they were one-third of a mile away, on Franklin Street. All the vehicles we’d seen before raced down our street toward the shots. As the minutes ticked by, we learned, from Twitter and the local news, that it would be over soon; law enforcement had surrounded the suspect. We knew what to expect, and counted the flash-bangs with our son. Eventually, H drooped with exhaustion, so we started to put him to bed, taking turns again sitting with him and singing over the sound of the helicopters. He fell asleep during “Edelweiss,” and my husband hugged me when I left the room — it was over. The outstanding men and women of law enforcement, aided by a calm and cooperative citizenry, had arrested the suspect. On Saturday, we went to Russo’s, and never have I been so happy to be there on an (incredibly) crowded morning. We took out the trash, and even that felt good. 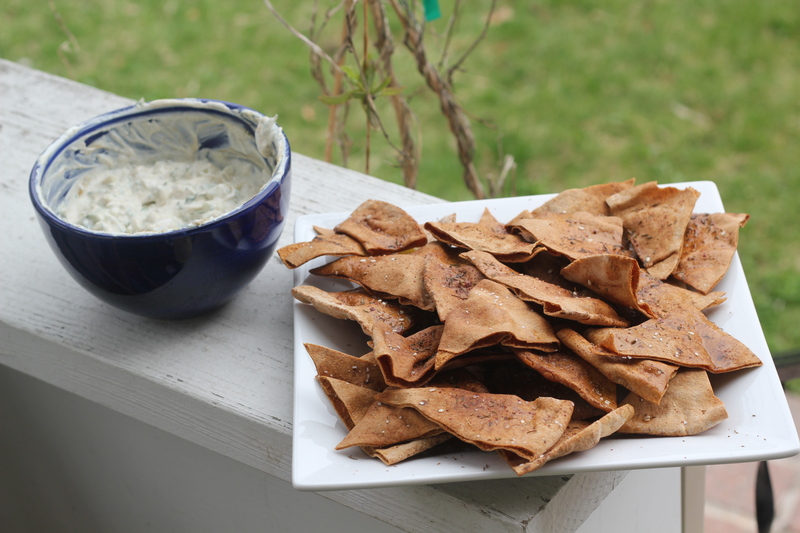 We ate lunch (homemade pita chips with zatar and tzattziki, for those who remember that this is a food blog) on the porch, chilly as it was, because we could. We drove to Mount Auburn Cemetery, and felt elated to see its familiar trees and stones. We share the sorrow of our city and pride in our town. for the police officers, state troopers, ATF and FBI agents, emergency dispatchers, firefighters, EMS teams, nurses, and doctors who stood at the ready, for hours upon hours, to keep us safe from harm. To donate to The One Fund, which will provide help to those most affected by the tragic events of April 15, please click here. 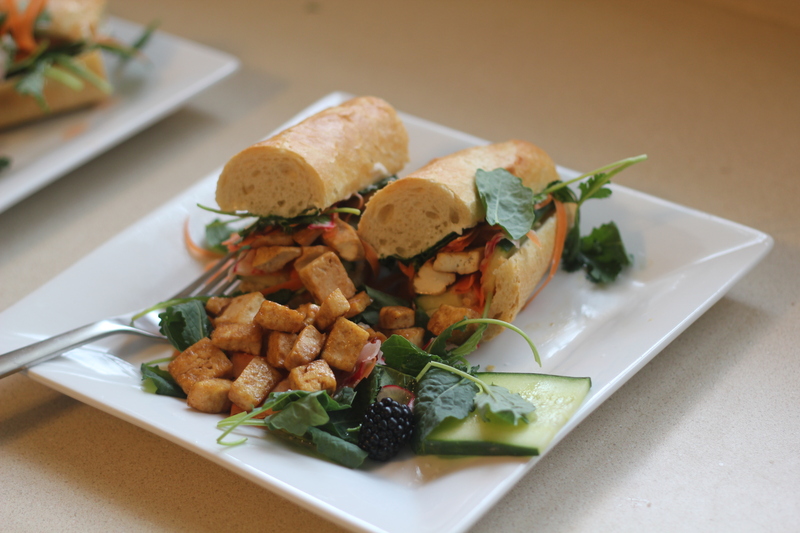 We found that the our variation on the original recipe made enough for two sandwiches, and we made a little salad on the side of each (baby kale leaves, extra pickled vegetables, cucumber, blackberries, and a splash of olive oil). Also: Siracha, where have you been all my life? 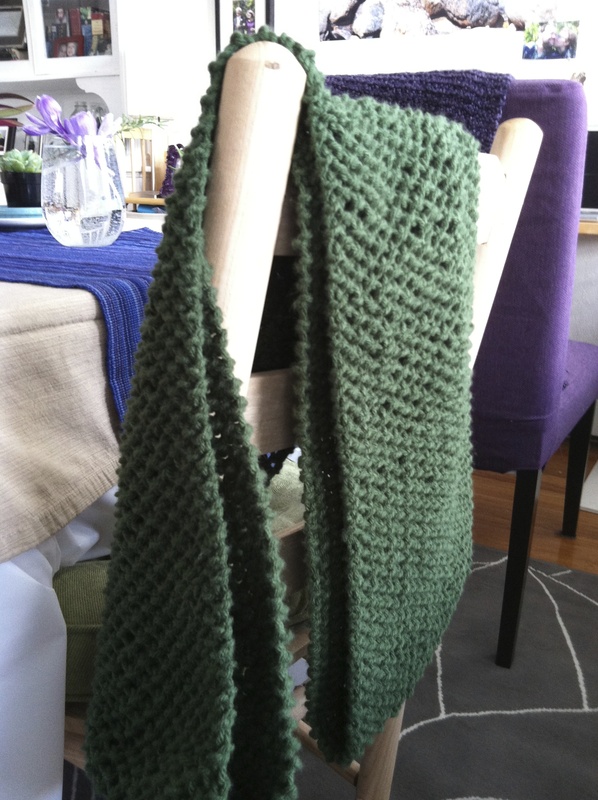 A Real-Life Finished Knitting Project! 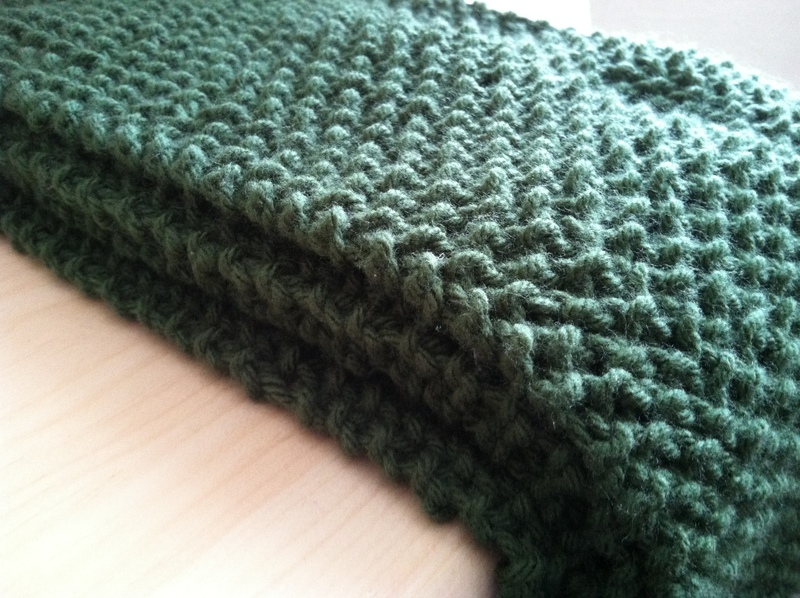 A knitted infinity scarf the color of Maine pines for my dear friend J.
Mr. O’s second culinary find this week was Claire Thomas’s Orecchiette Cacio e Pepe with Kale, Butternut Squash, and Burrata, which you can read about on her blog, The Kitchy Kitchen. 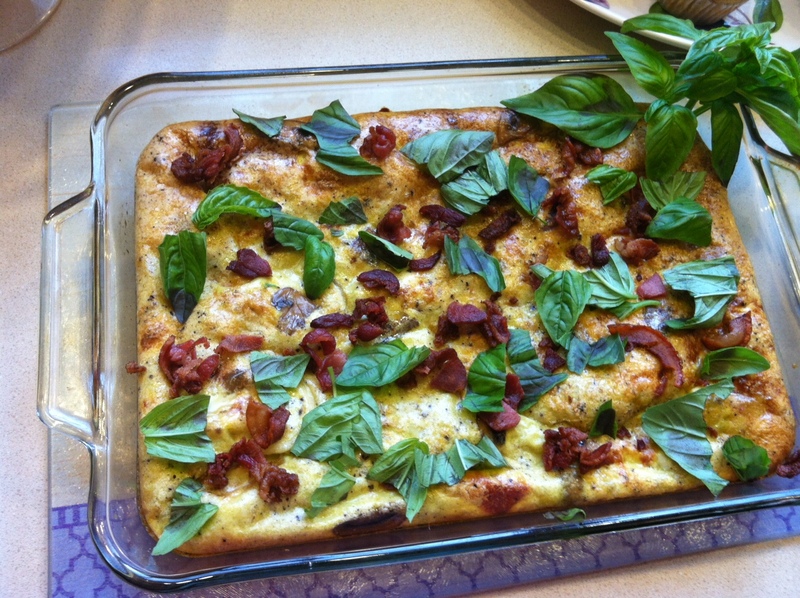 We love her vegetable lasagna, so this seemed like a surefire recipe. Until we got to Wegmans — yes, we occasionally truck 35 miles west to get to the happiest place on earth — and they didn’t have orecchiette. 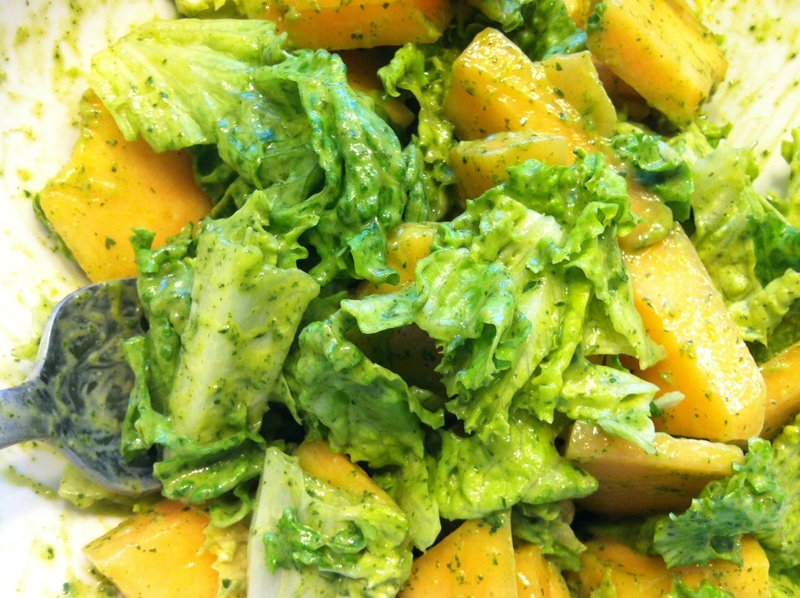 We forgave them, though, since they kindly provided incredibly cheap pre-cut, pre-cleaned kale and butternut squash, and contented ourselves with radiatore. I don’t care for pepper or Romano in large quantities, so I made a sauce with just a bit of freshly ground pepper — maybe two teaspoons? — about a half cup of pasta water, about a half cup of Parmesan, and olive oil. I didn’t remember to look for burrata, so I substituted fresh mozzarella, and more of it. 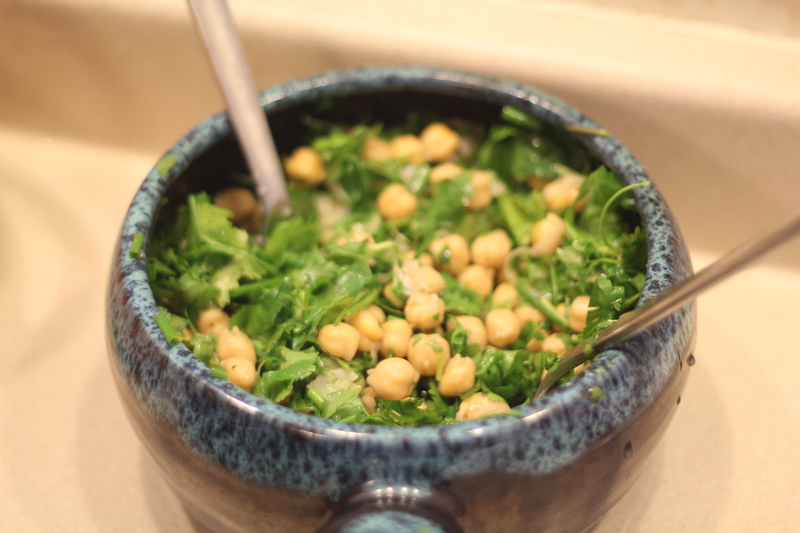 I love Tuscan kale, but not the price, so I substituted regular kale. I wanted to use up some spring onions, so I left out the roasted onion. And I made a balsamic syrup to top the dish. I think this turned out to be the perfect dish for the cool beginning of spring: it’s warm and hearty, but the crisp spring onion and sweet/sour balsamic syrup are refreshing. Roast the squash (tossed in olive oil with salt and pepper) in a single layer on a baking sheet. I had enough lead time, so I roasted it at 350 degrees for 40 minutes, but you could hike up the heat to cut the cooking time. Boil the pasta according to the directions (err on the al dente side). Toast the pepper in a pot with a wide diameter; after a couple minutes, turn to low heat, add the olive oil and kale, and cook gently. The kale should remain bright green. Simmer the balsamic vinegar in a small saucepan (or, if you’re like us and don’t have one, try a small nonstick skillet) until it’s reduced by half; it should be thick and syrupy. Slice the green onions (white and light green parts) and cut the mozzarella into small pieces (I use kitchen scissors). Just before the pasta’s ready, stir the Parmesan and about a half cup of pasta water into the kale and pepper mixture (reserve the other half cup of water in case you need to thin out the sauce). 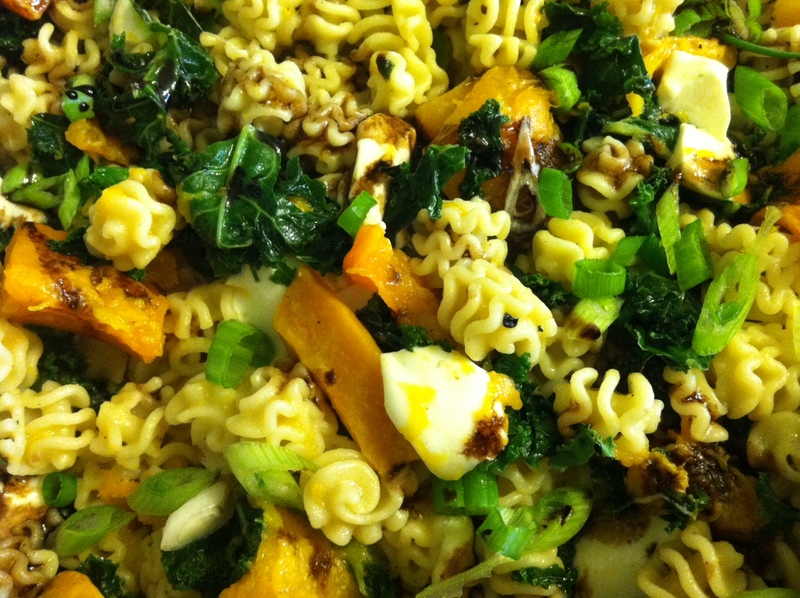 Drain the pasta and add to the kale, along with the squash and mozzarella. Add salt to taste and toss to combine. Top with the warm syrup and sprinkle with the green onions. Serve immediately. 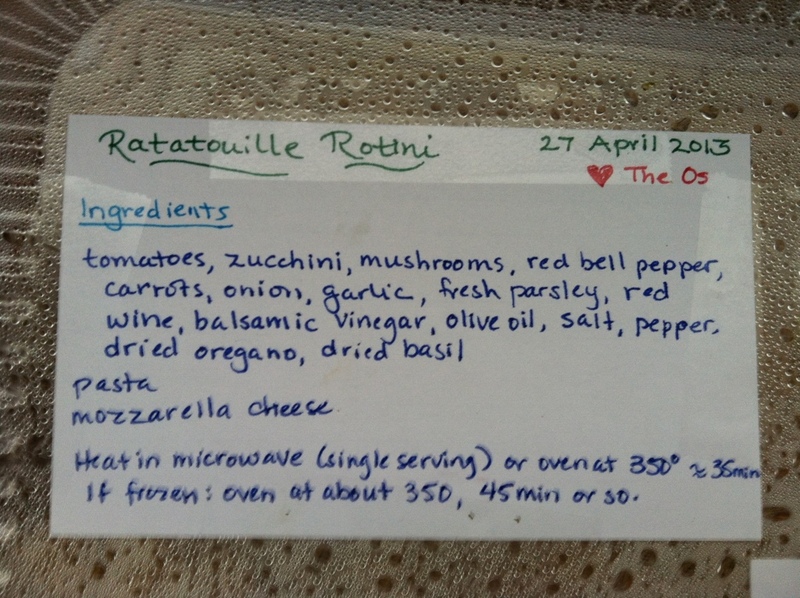 Mr. O helped plan our dinners this week, and he found this recipe on BuffChickpea, which is the basis for our salad. 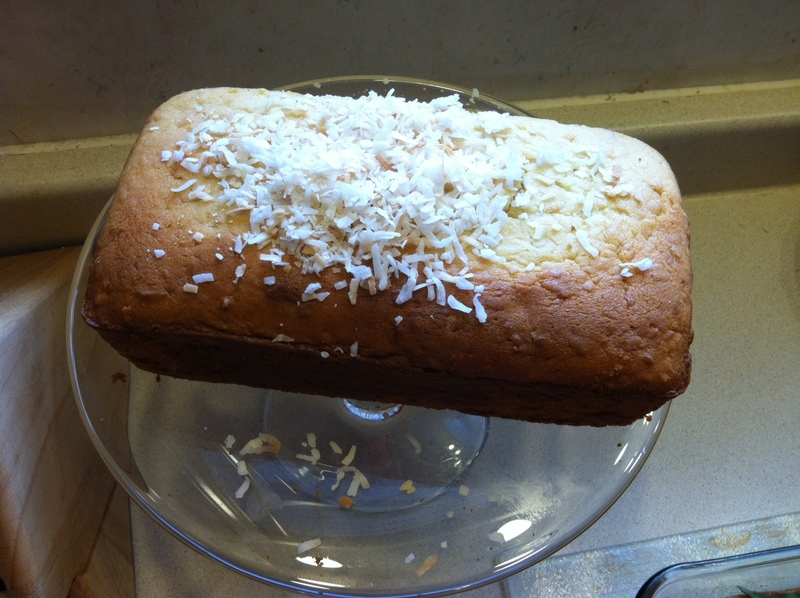 We made a few changes to the recipe we found, which was itself adapted from a Bon Appetit recipe. 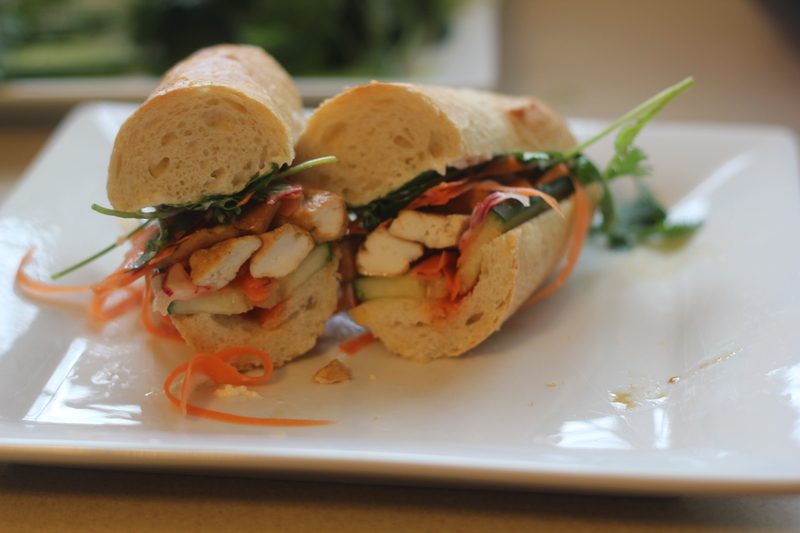 The result: tasty, filling, and (dare we say it), healthy. Bonus: our 22-month-old ate a few spoonfuls of barley and a “leaf” (a piece of basil). Soaking time: 1 hr // Active prep: 15 minutes, followed by 10 minutes of cooling time. Rinse barley and soak for an hour or so in cold water while you go about your business (we took our son to the playground). Bring 4 1/2 cups of lightly salted water to a rolling boil. Add the barley, reduce the heat, and cover. Cook about twenty minutes. While it’s cooking, halve the tomatoes, snip the green onions (white and light green bits) into small chunks, crumble the feta, and chiffonade the basil. Shake up the vinaigrette in a jar, or whisk it, if that’s how you roll. Drain the barley and allow to cool. We just let the barley rest in thin layer on wide plates while we folded a load of laundry, but feel free to toss it around a while if you’re in a rush. 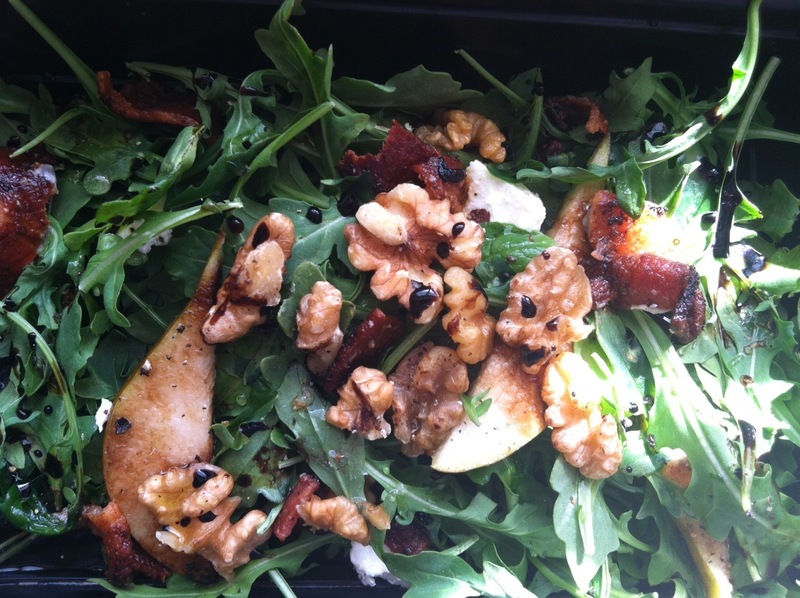 We ate this salad at slightly-higher-than-room temperature, and I think that’s best. 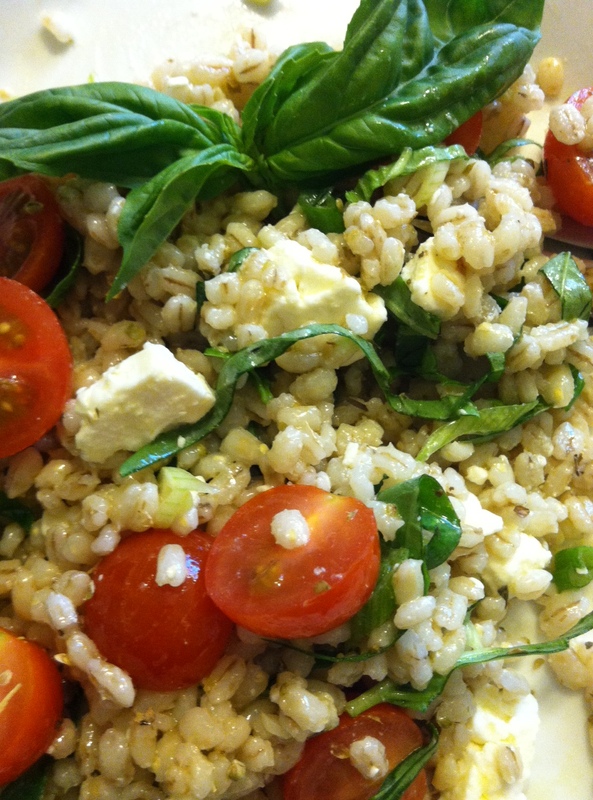 Toss the barley with the vinaigrette, green onions, and feta. Spoon onto plates and top with basil and tomato (I like leaving the basil and tomato unmixed so that they retain their structural integrity, but go ahead and mix it all together if you like). Season with salt, pepper, and dried oregano to your taste. 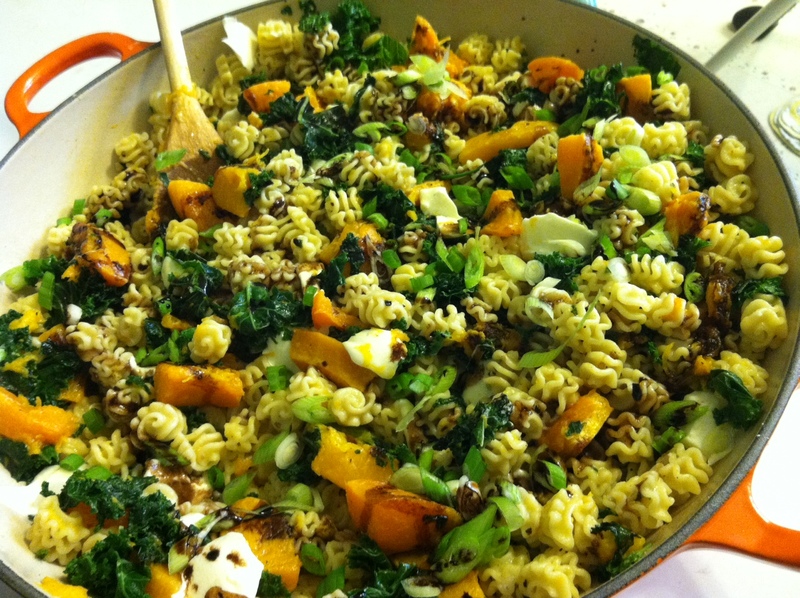 the original recipe calls for cooking the barley in vegetable broth. I’m sure that’s delicious, but we didn’t have any at home this week, and the salad was (we thought) perfectly seasoned with the vinaigrette. 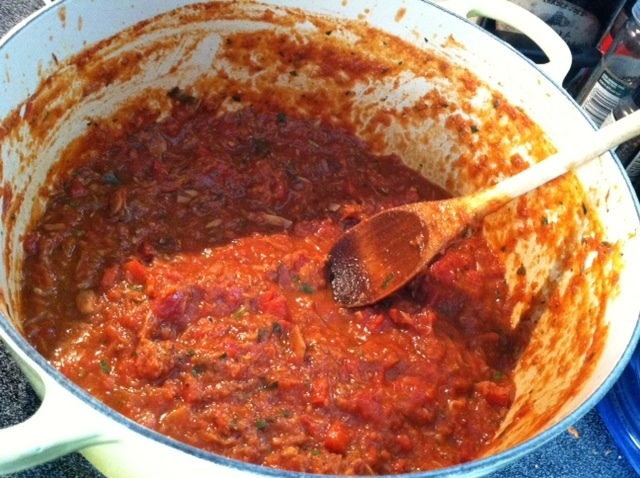 The oregano wasn’t in the recipe we found, but we liked it so much in a tomato sauce last night that we had to have it again. The original recipe calls for grape tomatoes. I don’t like them (too sweet) but you might. 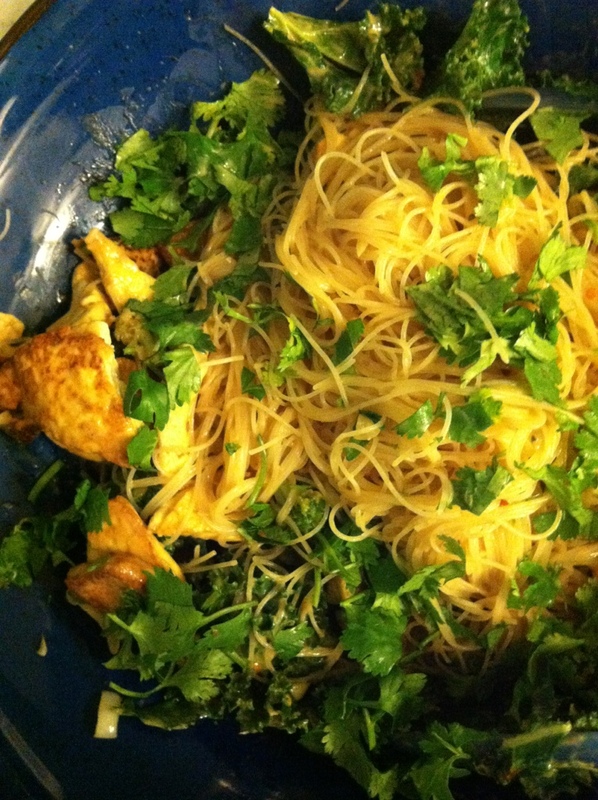 Topped with cilantro and a squeeze of fresh lime. 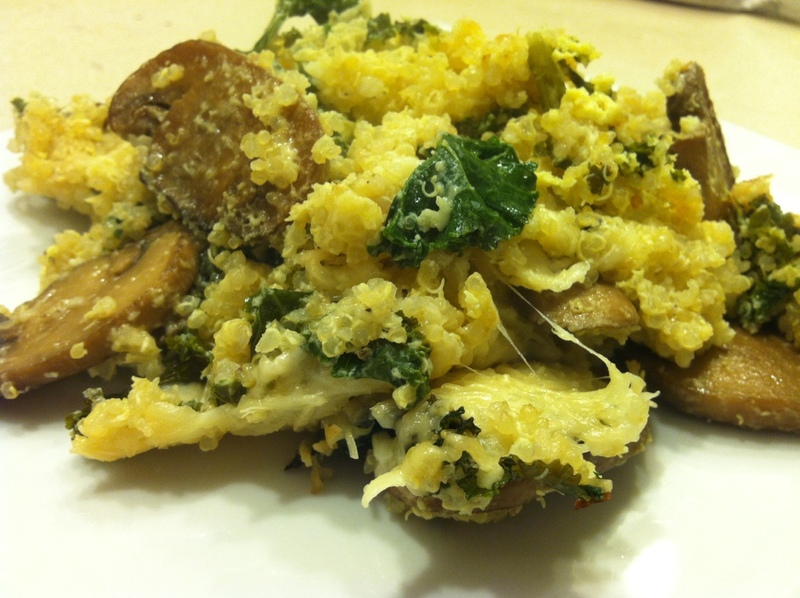 Quinoa baked with mushrooms, kale, and Parmesan cheese.
. . . which the Os were fixing to eat (ahahaha) before Mr. Baby woke up. 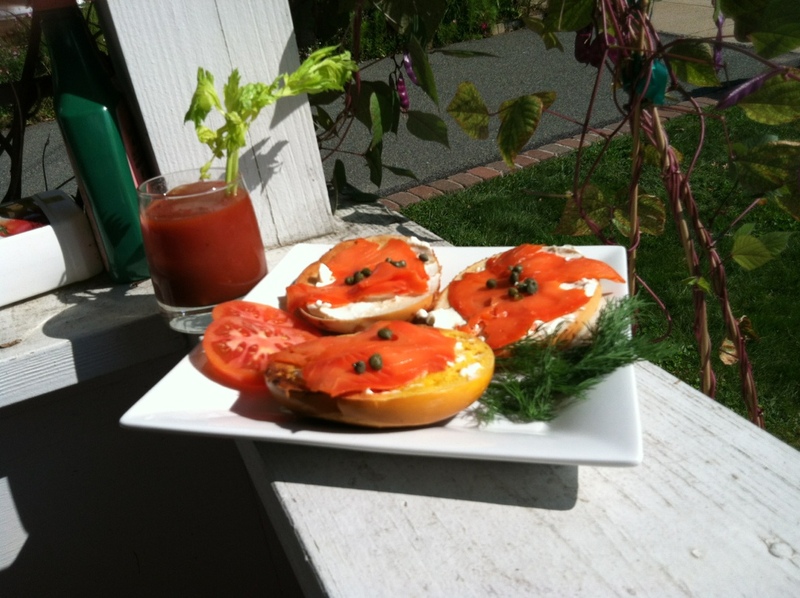 Of course, he woke up one bite into our bagels, and we subsequently learned, again, not to underestimate the toddler palate: he ate half a package of nova lox. And two capers.